That sunny afternoon yesterday reminded me that loads of bicycling fun is coming up in the Seattle area. It’s only February, but the local bike clubs already are offering a full plate of early season activities. The Cascade Bicycle Club registration for this year’s rides is an ongoing process and opened up to the general public on Tuesday (members get an early-bird opportunities). Here’s your link to register. 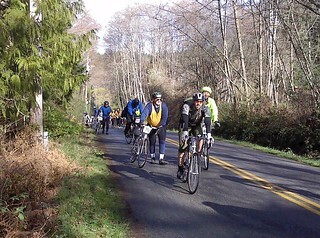 Among the rides open for registration is the STP (Seattle to Portland Bicycle Classic) which is 80% booked already. That means there are only about 2,000 spots left for the ride coming on July 13-14. This Sunday, Cascade is holding the Seattle Bike Swap from 9 a.m. to 2 p.m. at the Seattle Center’s Exhibition Hall, 225 Mercer St., Seattle. If you looking for some deals, this might be the place. Also this weekend, the Evergreen Mountain Biking Alliance is hosting some work parties. There will be a group down at Summit Ridge near Black Diamond on Saturday, another up at Paradise Valley on Sunday. Also work will begin again Sunday on the new Silent Swamp trail the club is building at Tiger Mountain State Forest. Check the calendar for details. Next week, bike traveler and author Willie Weir tells about his recent adventures bicycling through Myanmar (Burma) at 7 p.m. Tuesday at REI Seattle, 222 Yale Ave., North. The talk is titled Burma and Beyond: An Evening with Willie Weir. Willie sent out a heads up saying that it would be a good idea to get tickets in advance because the room has filled up for his previous talks. Here’s a link for tickets. Meanwhile, the Bicycle Alliance for Washington is inviting everyone to Transportation Advocacy Day in Olympia on Tuesday. Everyone is meeting at 9 a.m. at the United Churches of Olympia, 110 11th Ave. SE, Olympia. Everyone will be armed with information and talking points before they visit their local legislators to ask for more support for bicycling causes. Looking ahead a couple of weeks, the Chilly Hilly is coming up on Feb. 24 over on Bainbridge Island. If you didn’t hear, the mountain beaver didn’t see his shadow when he came out of his hole last week, so we should have plenty of sun and warm temperatures for the ride. And no wind.